Offering you a complete choice of products which include fins. We are Exclusive manufacturers for all types of Fins like Rectangle, Chanfered, Eliptical, and Trainagular. 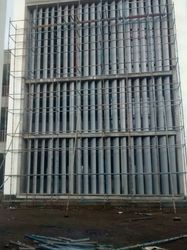 We can design fins upto 6m without support to withstand wind speed of 120kmph. We have supplied and installed more than 15000 running meter of fins in India and Qatar.